Your Shirt comes pre shrunk,ironed and ready to go! Clothing items that have been customized through the means of a heat press tend to last longer if you turn the garment inside out before it is washed, the reason this is done is to prevent any extra rubbing or friction on the design. It is also a good idea to wash the item in cold water on a delicate cycle, and when it comes to drying it is obligatory to dry it on a low heat cycle or better yet have it hang dry. Another important thing to keep in mind is that it is helpful to avoid harsh, corrosive cleaning detergents. You also shouldn't bleach your custom designed heat pressed clothing because that can mess up the design, as well as the color of the shirt itself. Naturally it is also helpful to avoid getting stubborn stains in the garment in the first place. Prevention is generally a much better route to take than difficult and harsh stain removal processes. However, if tough stains do happen try to remove the stain before it has time to set. Taking care of the garment itself, even when not being washed or worn is another important part of good care. For example instead of leaving it wet or damp it is better to have it dry and folded or put away. Doing these things can be very helpful for preventing the premature damage or destruction of your heat pressed shirt. (!) Please do not stretch design area in any way as it can damage it. Vinyl and especially printed design is applied on top layer of cotton/garment threads and excessive stretch can break it structure and color can be damaged and cracks or lost connection with fabric may appear. 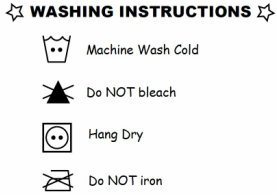 PS: Please note that some of the designs are not intended for washing/or often washing/or machine washing. We always recommend to consult with Creative Mom how to care about your order!